Before #kickstarter or #crowdfunding, I crowdfunded a CD for my Sanskrit Professor Dr. M. A. Jayashree. I think it was the year 2000 (or so). Before smartphones, before everyone could easily and effortlessly record a video or an audio file – we simply walked away with our memories, and other references and memorized (certainly we tried our very best) what we had toiled to learn. After a spell away, I had returned to Mysore and immediately Jayashree said – everyone wants a CD of the Yoga Sutras. By everyone, that meant 8 or maybe 20 students. I had just come from the stationary shop in downtown Mysore, where my friend, the exemplary flute musician, Ravi Mishra, was overseeing his family shop. I was buying my supplies for my studies, notebooks and a fountain pen and colored ink – as Sanskrit study will always be more engaged with sepia-hued or Jaguar green India ink and an art deco fountain pen. The shop counter displayed Ravi’s CDs, which I enthusiastically added to my haul. Then on to Jayashree’s. A CD? Well if Ravi had recorded CDs, then we could too! As it turns out, two brothers had opened a digital recording studio – the first in Mysore – and both had studied Sanskrit with Jayashree at the college where she was tenured. How delightful, all the parts were fitting into place. The current tribe of intrepid chanters pledged $5 per CD and away we went. I was in Mysore for 3 months. The CD was completed 1 day shy of 3 months. The CD we produced had red cover art and though it no longer is red, I’ll call it the Red CD. Even today you can buy a hard copy in the “shop” in her library classroom, or digitally from iTunes. 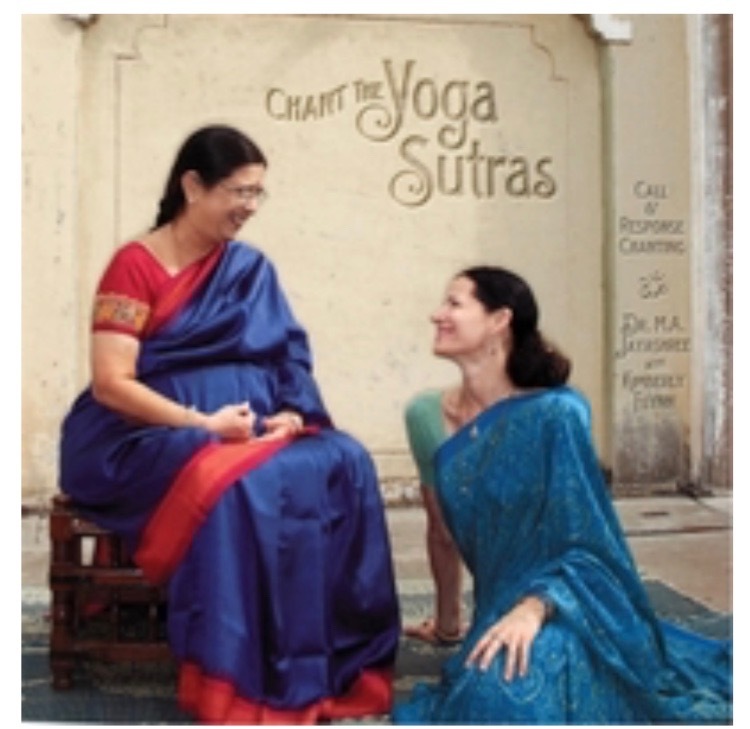 In 2005, again on return to Mysore, Jayashree said, everyone wants a call-and-response CD of the Yoga Sutras. And so it came to be. It is a 6-hour mp3 of she and I chanting in call and response. I have faced many learning challenges in life and the recording of this CD was one of the greatest. Why? We sang from different sound booths within the studio and I was unable to see her. And so the teaching which seems to flow like honey from the Guru’s lips into the shishya’s ears… well I think you get the picture. Also she chose to use a recording studio of another former student of hers, now in Bangalore. Yes these royal cities appear on a map side by side, and mighty Ayravarta, Indra’s celestial white elephant, thunders across the heavens in a flash, not so the big white luxury express bus of the same name. But it is done and that too perches on a shelf in Jayashree’s library, or as a download on CDBaby. If you don’t know CDBaby – before there was an itunes and before there was an etsy, there was CDBaby, a place where indie artists posted their music. And that CD is called the Blue CD, which as you can see from the above photo (an outtake from our cover art photo shoot) had a blue theme.